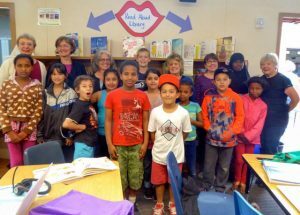 The Lake City Afterschool Program looks to their fourth year this coming Fall 2016. This will be the final year in transition, site-wise, as Fall 2017 looks to be back in the newly built Olympic Hills Elementary School. Presently housed at Cedar Park Elementary, this present site will revert to its historic roots and return to be the local elementary school for the Cedar Park neighborhood. There are five communities surrounding the Lake City District. Cedar Park being one; Victory Heights, Matthews Beach, Olympic Hills and Meadowbrook being the others surrounding Lake City. 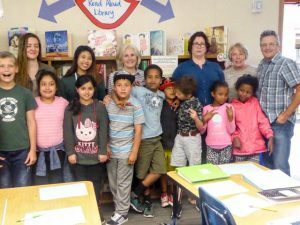 The success of two day a week after school program centers around a dedicated retired education ELL professional and a chorus of community that makes up a variety of dedicated volunteers. Pictured here are those who commit to the school year and work in a mentoring environment. With technological support, curriculum support and the committed vision of Meadowbrook Community CARE, the goal is to nurture young learners for future academic success. Two hours a week for a volunteer experience may seem like an inconsequential amount but the smiles and successful engagement tells a different story. A commitment to care.